Welcome to Crossroads, a $30 million themed entertainment area buzzing with activity. Among shops, restaurants and a theater, skilled craftspeople and artisans in period dress engage guests with demonstrations of glass blowing, candle dipping, peanut-brittle pouring and confectionery production. The blacksmith pounds household and decorative items, while Thompson's Gristmill & Bakery entice visitors with smells of freshly ground flour and warm cinnamon bread. One major focus of the re-created town is the 12,873-square-foot Great Barn, an indoor, four-story interactive playscape combining high-tech play with old-fashioned fun. It's a place where visitors interact with more than 70 educational games and kids can climb rope nets, explore mazes, bounce on trampolines and zoom down 40-foot super slides. 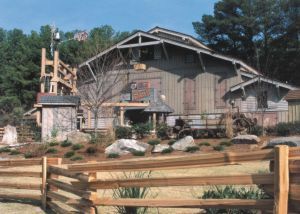 In fact, the Great Barn uses 21st-century technology to teach about 19th-century farm life. It's like a giant, live video game. Visitors wear electronic wristbands to score points at more than 70 interactive stations as they help the fictional Pickens family harvest their fruit. High scorers are posted by age every few minutes on the Big Harvest Quest Scoreboard in the building's center. Players take on the role of an 1870s farmer and try to meet their daily quota. Ranks range from Junior Farmer to Apprentice Farmer to Senior Farmer to the highest level of all, Master Farmer. Scattered throughout the Great Barn are 24 different items used in fruit farming: "Bugs" that harm fruit, "Broken Harvest Machine Parts" and "Tools" that repair the Harvesting Machine. Players must look around and find a box with a picture of one of the items, scan their wristband, and earn points. Or they can grab a harvesting bag and start gathering fruit as fast as they can. Players can also search for "Hints" tucked away in (secret) locations throughout the Barn as well as go to checking stations to discover how many points they already have and how many more you need to reach the next level. All of this instant scoring and interaction is possible thanks to the Smart Band Wristbands with RFID (radio frequency ID) technology. Made by Precision Dynamics Corporation in San Fernando, Calif., the Smart Band incorporates a computer chip and antenna, which allows application-specific information to be written to and retrieved from the wristband at any time by scanners or readers. "The band allows you to go through the facility and collect points, transmitting data and giving you recognition on the jumbo scoreboard," says Gerald Rakestraw, director of operations for Stone Mountain Park. While the Great Barn uses its wristbands for game scoring, Smart Bands can also be used for identification, tracking, purchasing, security as well as access and crowd control. The bands are lightweight, colorful plastic, thinner than a watch band. "The band is working very well for us," Rakestraw says. "It easily handles the amount of data we need to collect and store." About 350 people can play at the same time in the Great Barn using the wristbands. "The thing that makes them unique is that they are reusable," he says. Upon leaving the Great Barn, the bands are collected from players, sanitized and used again. With more than 4 million people visiting the Park annually, Stone Mountain Park is one of the most popular attractions in the United States and the most popular in Georgia. Although the Park's master plan allows for development of one-third of the property, family attractions—including the six-acre Crossroads—will be developed on less than two percent of the Park's 3,200 total acres. The remaining 98 percent of Stone Mountain Park will remain undeveloped. Interestingly, Stone Mountain is the world's largest mass of exposed granite, standing 825-feet and covering 583 acres or 25 million square feet. It is nearly 300 million years old and extends underground over half of Georgia and into North Carolina. The Confederate Carving on the north face of the mountain is the world's largest relief sculpture and covers more than three acres of the mountain's face. The carving shows Civil War figures Jefferson Davis with his horse, Blackjack; Robert E. Lee and his horse, Traveler; and Thomas "Stonewall" Jackson and his horse, Little Sorrel. General Lee stands nine stories tall.